Netting: Comes in ten foot height by 20' or 30' long. Arrows will not penetrate. Just dig into ground 2 or 3, 4x4’ posts, run a cable or heavy poly rope between and attach with plastic ties. Goblin 4-7 years of age Right or left hand Scout: Compound 4-7 years of age Right or left hand. Wizard: 5-10 years of age Right or left hand. Crusader: 9-13 years of age Right or left hand. Titan: 12-+ years of age Right or left hand. Firebird: 12+ years of age Right or left hand. Best deal as ones listed below come with package listed in red. You can get them at a slightly lower price for just bows but with these extras, you are better off. 48", 54" or 62" Bullseye X Recurve bow Take down design. Multi laminate limbs, sight and flipper style arrow rest. (C--ES-A5BEX48" or 54" or 62" Bullseye X Recurve in thee sizes. Sight arrow rest, and stabilizer mountain holes. Multi laminate libs. Wolverine (ES=-ARB124OR) Recurve take down designed for adults. The riser features a sight, arrow rest, and stabilizer mounting holes. Flash Bow Set. (ES-AYS500) Red or yellow. . 5-12 draw weight. 16-24 lb draw length. 32.75" Axel to Axel. Peak draw weight 5-10 lbs. Draw length 18 to 25 "
FLASH, SPARK, WARRIOR & BRAVE INCLUDE: 2 arrows, armguard, 2 piece arrow quiver, finger tab, Whisker Biscuit arrow rest and pin sight. These bows look like the bows seen on TV shows, Hunger Games etc. Not quite the same but similar look. Genesis Bows also available. Contact me for information. 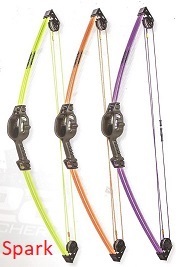 Arrows: Choice of sizes 26”, 28” or 30"arrows. Safety glass arrows are stronger and safer than wood arrows. Unlike wood shafts, these fiberglass arrows feature high flexing qualities and will not break or bend. The younger the the child, the smaller the arrow. 30" (ES-#A08111) 1/2 gross. $194. The arrows above have different colored index vanes. Wood Cedar Shaft arrows also available. Pack of 72, 27"(ES-#AWS27)... $132.00 for 1/2 gross. Targets: Foam targets come in 36” and 48” diameters. They are resistant to wear, weatherproof, and impervious to insects. This is a self healing target. Each target comes with one lighter weight face cover . After a few years, turn the target around to get fresh side. These targets are reversible adding years of life to target. 48” skirted .........................(#ES- A48RD) $27.70 Heavy duty poly burlap. companies and sold about the same price as the 4 oz. listed above. I do not recommend for camp use. I refuse to sell them as the quality is not worth it. If you see prices less than our prices, you are getting the lower quality 2oz. face. Replacement Dacron Double loop braided dacron Strings- 40-42", 48",50"54",56" or 60". Min. of 6 $4.90 each. $24.40 for each pack of 6.